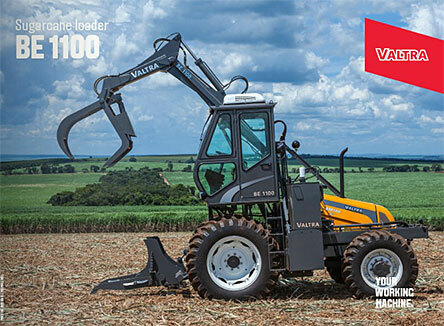 Combining lightness with ruggedness, Valtra presents the best in sugar cane loaders. 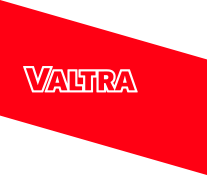 Reduction of fatigue, breaks and maintenance, increasing the service life of all equipment, including the tractor, due to the exclusive shock absorber system and rotating cylinder relief valve on the laminated 8” U-shaped chassis beam, internal reinforcement and the lock that joins the upper and lower beams. Increased strength of the hoses, preserving the high flow, reduction of the temperature and wear of the hydraulic components with the use of 3/4” tubing and 5/8” hoses. Ruggedness and durability due to the structure and chassis with a massive 5” mast and also the stuffing of all external joints. It allows repositioning of the operating levers according to the needs of the users. More lightness and strength. The BE 1100 provides greater stability of the assembly and less transferred motor force due to the lateral counterweight compatible with the capacity of the loader.